Lange’s metalmark butterfly. Photo courtesy of Eric Palm. 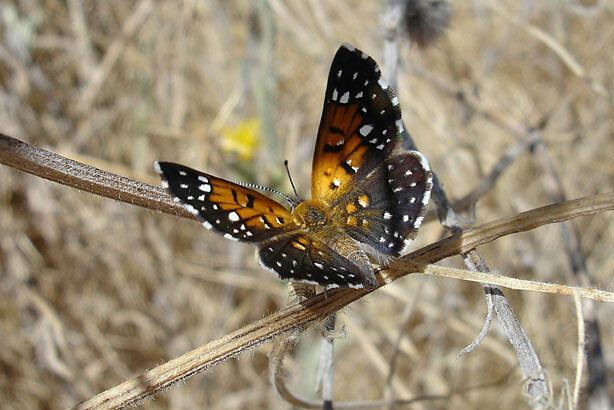 Biodiversity in the once-thriving Antioch Dunes of Contra Costa County is in decline. After the 1906 earthquake, sand from the dunes was harvested to make bricks to rebuild the city of San Francisco. 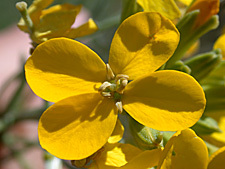 Since then, encroachment from growing Bay area communities has further fragmented habitat in the region and invasive plants are threatening survival of three species that are found only at Antioch Dunes: the Lange’s metalmark butterfly, the Antioch Dunes evening primrose and the Contra Costa wallflower. In 1980, the 55-acre Antioch Dunes National Wildlife Refuge was established to save some of the last remaining habitat for these species. PG&E owns and manages 12 acres of property adjacent to the refuge—two 6-acre parcels that contain towers that carry transmission lines throughout eastern Contra Costa County. Employee volunteers will continue to visit the site at least twice a year to remove invasive weeds on the property. This commitment will continue for as long as the agreement is in place. Moving forward, we will also continue to support the refuge's efforts to monitor the population of the endangered species at the site. As part of a cooperative “safe harbor” agreement with the USFWS, our crews are able to safely maintain and operate these transmission lines while enhancing habitat for the sensitive species that call the area home. Under the safe harbor agreement, we worked with the Service to manage our property in ways that benefit the recovery of the native species. For example, we removed invasive weeds through a combination of employee volunteer work and the targeted application of herbicides. As a result, we reduced invasive weed cover at the site by 13 percent, making our property more suitable for replanting the host plant for the endangered butterfly. 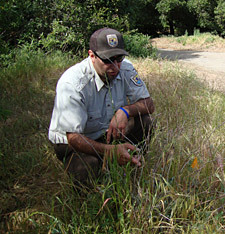 PG&E also lent assistance in surveys to monitor the recovery of the butterfly. Last year, the population was at a record low of 98 butterflies—the lowest number counted in the last 25 years. However, the Contra Costa wallflower and Antioch Dunes evening primrose have both increased in population over the last two years.